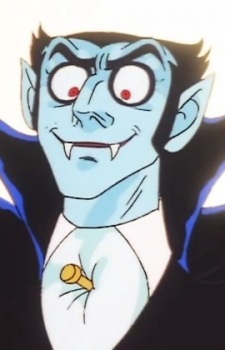 The legendary vampire who finds himself having a harder time living in Japan than he did in Transylvania. He spends his days sleeping in his coffin in the basement of his castle, and his nights prowling the streets of Shinjuku and Shibuya. He's weakened by water (in almost any form) and anything in the shape of a cross. He can be destroyed with a stake through his chest. Sunlight will turn him into dust, but Igor or Chocola will usually vacuum him up and then reconstitute him ala instant ramen with a magic spell that includes a cup of blood plus the contents of the vacuum cleaner.